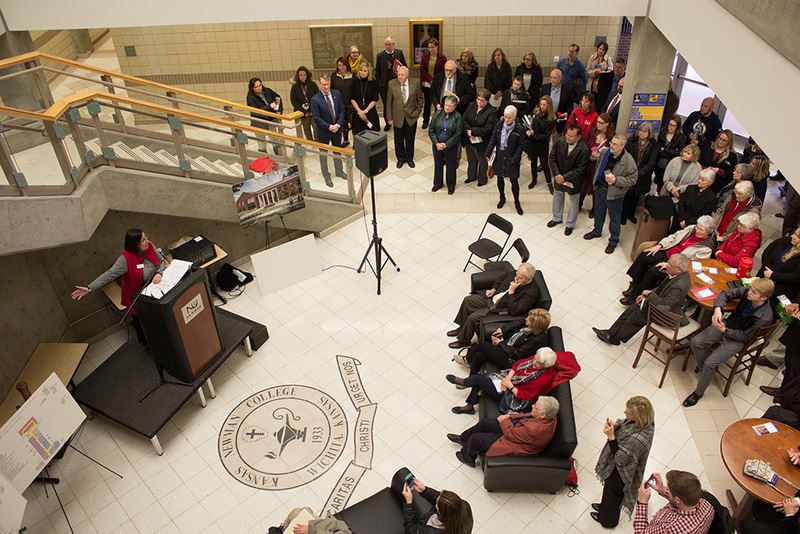 A large crowd consisting of the Newman University community along with local news media gathered inside Eck Hall Jan. 9, 2017 as Vice President for University Advancement J.V. Johnston took the stage. Johnston announced to the public that funds raised for the new Bishop Gerber Science Center on the Newman campus have exceeded the initial goal and now total $24.85 million. 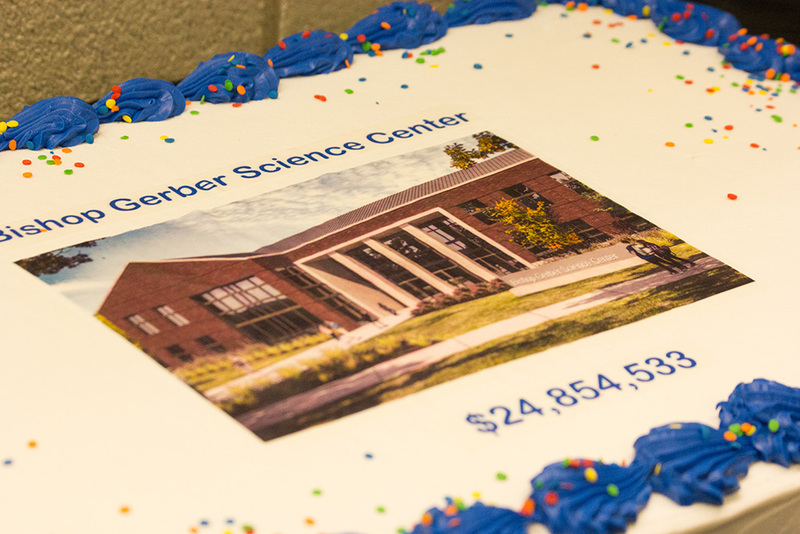 Raising capital for the state-of-the-art Bishop Gerber Science Center was a major part of Facing Forward – A Campaign for Newman University. 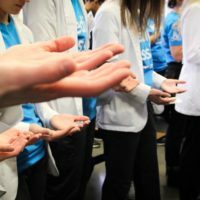 The campaign also raised money for upgrades to the nursing and health science programs facilities in Eck Hall, the Newman Fund, and the university’s endowment. The ceremony was also held to mark the “Topping Off” of the new science center. As explained to the crowd by Newman University President Noreen M. Carrocci, Ph.D., Topping Off is a tradition in the construction industry when the highest point of a building under construction is reached. Construction crews typically place a tree similar to a Christmas tree at the highest point as a symbolic tribute to the wood (or more often today, steel) used to construct the frame of the building. 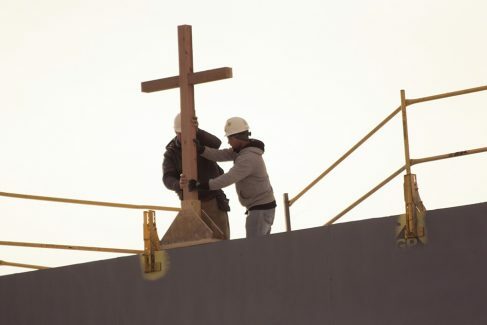 For many religious buildings, a cross is erected instead of a tree, which was to be the case in this Topping Off for the new science center. Carrocci also made an unscheduled announcement based on recent events. On Thursday, Jan. 5, construction workers began to remove the dedication plaque from the existing Heimerman Science Center, which will be replaced by the Bishop Gerber Science Center. A cylindrical object appeared behind the plaque and was believed to be a time capsule. At the current time, no member of the Newman community knew anything about a time capsule being placed behind the plaque and there were some doubts that the object was a time capsule. The capsule would have dated back to 1966 when the Heimerman Science Building was completed. The object was fully removed from the wall on Jan. 6 and it was confirmed to be a time capsule. Carrocci decided that the Topping-Off ceremony would be an appropriate time to unveil the contents of the capsule. “I didn’t trust myself from peaking, so I let Bruce [Director of Facilities Bruce Sanderson] hold on to it for me,” said Carrocci. 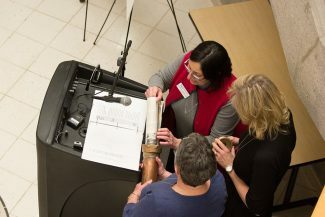 Newman President Norreen M. Carrocci, Ph.D. removes contents from a time capsule that was located behind a dedication plaque in the Heimerman Science Center. Carrocci removed the cap from the capsule. Inside, she found news articles dating back to 1966, a Challenge newsletter (the predecessor of today’s Newman University Magazine), photos, marketing material and other items from what was then Sacred Heart College in the mid-1960s. The items were given to University Archives to be documented and cataloged. Following the time capsule reveal, attendees enjoyed a commemorative cake and walked outside to witness the Topping-Off Ceremony. Two construction crew members raised a wooden cross on top of the Bishop Gerber Science Building. Guided tours of the building were also available to attendees. The event was covered by The Wichita Eagle and The Wichita Business Journal. See video of the time capsule reveal here, and the Topping Off here. Editor’s note: An article is to be published at a later date describing the time capsule items in detail.